The human ear can detect sound vibrations in the range between 20Hz to 20kHz. We perceive low frequencies as bass and high frequencies as treble. The distribution of sound energy across this frequency range determines the tonal balance. 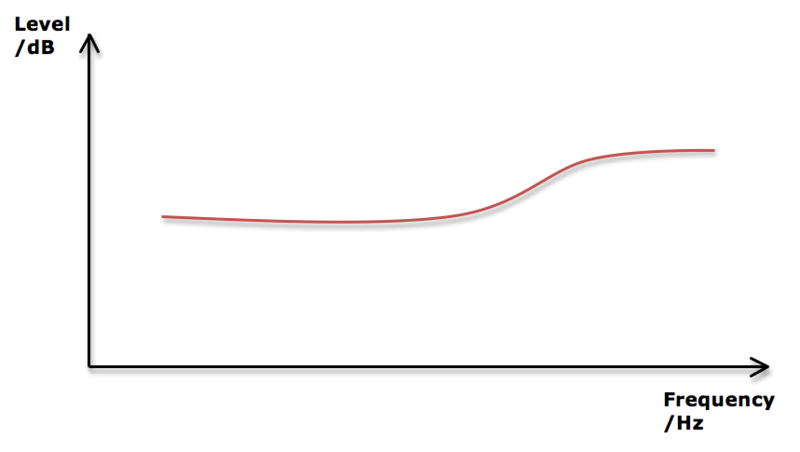 For example, this graph shows a frequency response curve with a lot of treble or high frequency energy. This frequency response shows a very uneven distribution of energy. How do we control it? It is possible to filter the sound using equalization, or more commonly called EQ. This is arguably the most important tool for optimizing the sound in the car. An equalizer is made up of a number of bands of filters. Ideally you have between 6 and 12 filters per channel. In the EQ, you can select 4 parameters. A high pass filter only allows higher energy to pass through. So for example, if I set the frequency to 55Hz, then the energy below this would be cut off. If you have a system with many active channels (i.e. separate channels for the tweeters), then you need to select which part of the audio signal you want to go to each loudspeaker. Use the high-pass filter on each channel. To protect the loudspeakers from too much low frequency energy. If the loudspeaker receives too much bass, the membrane could get damaged with constant over-excursion, and you will experience a lot of unwanted distortion. How do I set my high-pass filters (HPF)? For the purpose of this example, I will assume that the system comprises 4 identical full-range loudspeakers (i.e. 2 front & 2 rear). Listen to the front speakers only. Get your bass playlist out. Not just your reggaeton, but a variety of things like jazzy double bass, low pianos, rock, techno, dub, solo organ. Make sure at least some of the audio contains sub-bass frequencies (below 60Hz) that make your bum jiggle. Listen to several tracks at a medium-high volume step and concentrate on the bass. Do you hear clean kick drums, even organs and double basses, and full extended bass? Or do you hear distortion, a forced sound as the loudspeaker is pushed beyond its limits? Are the doors vibrating wildly, or does the system still sound controlled? Listen to the voices as well as the bass. Do the low frequencies cause distortion on the voice? Try adding a HPF at 80Hz and repeat the listening. What do you notice? Is the sound more clear, do you hear new details? Can you turn the system up louder without experiencing the same distortion? 80Hz is usually too high for the HPF, as we don’t want to remove so much bass energy. However, doing this allows you to create a reference for yourself. Now you should lower the HPF gradually and eventually find the right balance between having enough bass and preventing distortion. Try setting the HPF to 60Hz, then 30Hz, then 50Hz. Make notes and find out what you prefer. You can come back to this filter to tweak later in the process, but get one in there from the beginning so you don’t blow any speakers before you get started! A low pass filter (LPF) only allows energy below the filter frequency to pass through. So for example, if I set the frequency to 5kHz, then the energy above this would be cut off. Why do we need low-pass filters? If my system consists of 2 front woofers, 2 front tweeters and 2 rear full-range speakers, I would need to select the energy that I want to go to the woofers and tweeters. I would use a LPF on the front woofers at a frequency around 2-6kHz (depending on the tweeters). This means that the high frequency energy comes only from the tweeters. Most of the filters you will use are known as peak filters. There are 2 main ways to use peak filters. Spectral shaping. There may be broader bands of energy that you would like to change. In this case, you can use a peak filter with a low Q factor setting. A low-shelf filter is used at low frequencies to boost or cut everything below the centre frequency. If the overall bass level is too much or too little, use a shelving filter to shape the overall balance. NB! The bass and treble tone controls in most standard radios use a shelving filter at low and high frequencies. So you are in the car, you know what your filters can do, now what? The equalization process is cyclical, and for me it goes like this. Fine-tune the filters. Try to reduce the filter gain and listen. Does the problem return? Try to increase the Q factor and listen. Does the problem return? If yes, leave the Q factor where it was. Am I happy with the sound of the front loudspeakers for now? If yes, move to the rear seats, switch on rear loudspeakers only. Make some frequency response measurements to give you an idea of the overall energy distribution, and to highlight any obvious problems. Sit in the front seat and make these 3 measurements. We will write a more detailed blog about in-car measurement techniques in the coming months, but for now, use these guidelines. Play a pink noise signal at a medium-high volume. That means loud enough to excite any vibrations but not deafening. I would use earplugs for these measurements anyways. Repeat the measurement to check the first one was good. If you have major differences, repeat again until you have a consistent result. Hah! Were you expecting a nice flat curve, like you’ve seen in the movies? How do I identify problem areas? Let’s take this curve as an example and describe what we see. It is a measurement of front pair only. The bass is quite uneven with peaks at ??? There are mid-range peaks at ????????? There is some missing energy at ???? I like to get rid of the big issues first. So in this case, I would place a peak filter at ?? ?Hz, perhaps -10dB with a Q of 3. Measure again. Did your filter hit the right spot? Next I would remove a couple of those nasty mid-range resonances. Remember our ears are most sensitive in the mid-range, so any large peaks between 500Hz and 2kHz will really stick out. I would place filters at ???? and ?????. I mentioned that there is some high-frequency roll-off. I would use a high shelf filter at around 6kHz with a gain of 4dB to try to open up the sound. I always spend more time listening than measuring for shelving filters. Try playing around with the frequency and gain. If you don’t really hear a difference, boost more until you do, then reduce gradually to a point that sounds natural. It is easy once you start to remove more and more energy until the point where the system sounds thin and unnatural…even if the curve looks nice and flat. If you get to this point, follow these steps. Bypass the whole EQ. The system will of course be louder, but is it also better? What is it that is missing from the EQ’d tuning? Remove each filter one at a time and listen to the effect. Does every filter have a good effect? Try to increase the Q factor. You might be removing too much energy with low Q factor filters. Try making some filters more narrow to remove the problem frequencies with more precision. The goal is to remove JUST the problem frequencies and not a whole lot of energy either side of them. Think precision! What is the target frequency curve? If I wanted to be all audiophile about it, our target curve would be a perfectly flat line across the frequency range. But is that really what we want in the car? And does flat really match your listening preferences? No and No! For a number of reasons. Firstly, in the car we generally want the energy to be distributed as a slope from low frequency to high frequency. Why? Well, everybody likes bass, but more importantly, as soon as you switch on the engine, a huge amount of bass energy will be masked. When you start to drive, there is a lot of LF noise from the road and the engine, so in order to hear our music the way we like it, we need to start with a bass boost. Secondly, a flat response is pretty boring to listen to. Unless you are a studio engineer or an acoustician in a lab, we can have a bit of fun with the sound. Depending on your music and drug tastes, you may enjoy accentuated sub-bass, or perhaps more focus on the mid-range for Classical listening, or clear upper mid-range for good speech intelligibility when listening to the news on the radio. What you see does NOT equal what you hear! Tuning is a cyclical process – don’t give up, you’re getting closer to the perfect sound! That’s it for Tonal Balance and Equalization Techniques. Look out for part THREE where we will dive of from The sound stage.